Hello again from Sakai. After eight busy weeks of home ministry this summer, it is good to be back in Japan. As we look ahead to the future of the ministry here, the Fall is looking to be an exciting time for us. However, before we get to that, we want to share a bit about our time in the States. We had a wonderful time of home ministry this summer. 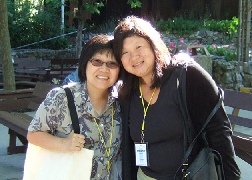 We arrived in late-June, just in time to attend Mount Hermon. Besides being greatly encouraged by the fellowship we enjoyed at camp, we also had the chance to share about our ministry and encourage people to be active in missions. Luke loved having day care in English and couldn’t get enough of the swimming pool or the soda fountain. 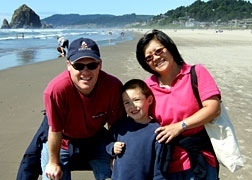 For all of us, it was a very nice break from the hustle and bustle of life in Japan. We spent all of July in the Los Angeles area, and then the first two weeks of August in Portland, OR and Spokane, WA. The main purpose of our visit was to visit as many of our supporting churches as possible. In total, we visited 8 different churches on our trip, and shared 18 times about the ministry at SIBC. 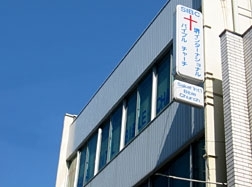 We are so thankful that God has provided such wonderful churches to support and partner with us as we serve in Japan. Of course, we were also able to see family and re-connect with many old friends. All in all, we returned to Japan refreshed, rested and encouraged by our short stay at home. Thank you to all of those who extended their hospitality to us, and for all of those who support us through prayer and finances. May the Lord richly bless you. Soon after returning to Japan, the church leadership team met with the landlord of our current building. During the course of our conversation, it was decided that we will vacate our current church facility by November 10th. Let us explain a bit. SIBC currently meets in a 3-story building called the Daikin Building. The Daikin Company, which used to occupy the whole building, moved out of the third floor about 15 years ago, thus allowing us to move in. However, Daikin would now like to move back into the third floor. Since the building belongs to Daikin, the owner has granted their request and offered to add a fourth floor to the building for SIBC to use. However, after reviewing the blueprints in late August, the church leadership team decided that the proposed fourth floor would be too small (it is a lot less space than what we currently use) for the growing needs of SIBC. Therefore, our only other option is to move to a new location. Though it may seem like we are being forced out, we truly believe that God is leading us in this matter. However, this means that we need to locate a new facility and move the church in less than 2 months. We have begun looking at a number of possible buildings, but so far we would have to pay double our current rent just to get a building the same size as our current one! We wouldn’t mind paying double the rent if we could get double the size. So, will you please pray with us regarding a new facility? Specifically, please pray that God would provide the right building for SIBC to meet in. We feel called to remain in downtown Sakai, which is the where we are in now, but which also happens to be one of the most expensive parts of town. We would also like to meet in a slightly larger facility that would give us added office space, classrooms and a larger sanctuary. Plus, the new facility needs to fall within our limited budget. Indeed, in order to get the size we need, in the location that we feel called to, and at a price that we can afford will take nothing less than a miracle of God. Fortunately for us, nothing is impossible for God. Pray for that miracle! We believe that it is God’s plan for us to move, so we also believe that God will provide the right place for us. In the meantime, please also pray for the leadership team. May God grant us faith and wisdom from Him as we seek Him during this very important time in the history of the church. In the midst of all of the uncertainty regarding the future of the church, on September 10th SIBC celebrated it’s 20th Anniversary. As our gaze is firmly fixed on the future, we are also keenly aware of all of the people who have brought SIBC to where it is today. Without the hard work and dedications of the hundreds who have come before us, SIBC would not be here today. We thank God for his faithfulness to us in the past and we look forward to the wonderful things He has in store for our future. Thanks again to all of you for your support of the ministry here. We consider each of you to be a valuable partner in the work that the Lord is doing in Sakai, Japan.